Getting your kids dressed and out the door each day shouldn't drive you bonkers. Except that it does, because your child wants to wear a tutu or bathing suit or Batgirl cape (or all three) to school. And you really just want to get out the door. If you need to minimize the drama, the power struggle and the full-blown assault on your sanity involved with getting your child clothed in the morning, these 15 proven tips from experts and moms can help. Take photos of her favorite outfits and create an online "album" of greatest hits you can peruse together on your iPad or smartphone. Involving her in the process can give her some much-needed ownership over the situation. "When your child protests a certain outfit, she's probably not really saying 'I want this purple shirt and those orange pants,'" says parenting expert and bestselling author Susan Newman, Ph.D. "She just wants control over something." Try an organizational system.Investing in a days-of-the-week clothes organizer has been a lifesaver for Jenni, a mom of two girls. With a cubby system, her daughters choose a week's worth of outfits on Sunday and sort them by day. "Sometimes they change their minds and dive back into their closet to choose something completely different, but even that now brings up less drama," she says. "Plus, I get a laundry bonus: About 10 fewer outfits to hang or fold, because the girls often pull their favorites right out of the dryer and into the clothing organizer!" Create a reward system to encourage her to get dressed quickly. Whenever Dr. Robyn's two kids do something without having to be asked (in this case, get dressed without a tantrum—or even an extra clothing change) she gives them each a craft store pom-pom to put into a "pom-pom box." When the box is full (hers hold about eight pom-poms each), the child gets to choose a small toy or treat—such as a sticker, eraser or coloring book—from a prize bin. Put your favorite clothes at the top of the dresser and bury the things you hate. "My daughter loves all of that neon '80s stuff and I can't stand it,” says mom Pamela. "Sometimes that stuff just accidentally makes its way all the way to the bottom of the drawer." Where it's, ahem, harder to find.Another tactic: Just go ahead and get rid of the items you really can't stand. We're not talking about his beloved, tattered Spongebob t-shirt or the light-up Rudolph tie Grandma picked out. We're just saying that when you approve of most of what's in the closet and dresser, you're less likely to have an issue with what he wants to wear. Create a whiteboard "menu" of ideas—and let her choose. As with the photos-on-a-smartphone idea, this method gives your kid some control over what she wears. Grab a dry-erase board and some colorful markers, and plot out outfits, and let her pick when she wants to wear each one. If she's old enough, she can plan her outfits herself. Then make her promise "no backsies." Let her have choices... but not too many. If you ask, "what would you like to wear today?" she's entitled (and likely) to respond with something outrageous -- like a ninja costume or her flower girl dress. (Hey, you asked!) Instead, say something like, "which of these two skirts would you like to wear with this top?" or "would you like to wear your red boots or your white sneakers today?" It gives her a sense of control that's still within yours. Do a comfort-check on her clothes and get rid of anything that's scratchy, itchy or just plain uncomfortble. Some kids are more sensitive to protruding seams and tags and abrasive fabrics—and trust us, they'll let you know it. By getting rid of the clothes, you'll save yourself the hassle of multiple outfit changes because something "just doesn't feel good." Don't expect the impossible. Keep your kid's developmental milestones in mind: Your 18-month-old may be able to help undress herself, but you shouldn't expect your kid to be able to get dressed without your help before she's 3. Even 5-year-olds and 6-year-olds may need your assistance with buttons, zippers, shoelaces and the like. Let "natural consequences" make your point. Tired of having the "but it's cold outside, sweetie, you need a jacket!" conversation? Then stop! "The first time they get cold, they'll quickly understand why you suggested a sweatshirt," says mom Kalai. The experts agree. "If she wants to wear PJs to preschool, let her," says Newman. "When the other kids tell her that's silly, she probably won't want to do it again." Choose your battles. If her outfit of choice isn't dangerous, seasonally inappropriate or disrespectful (think: a gorilla hat in church), sometimes it's best to just give in and let it go. 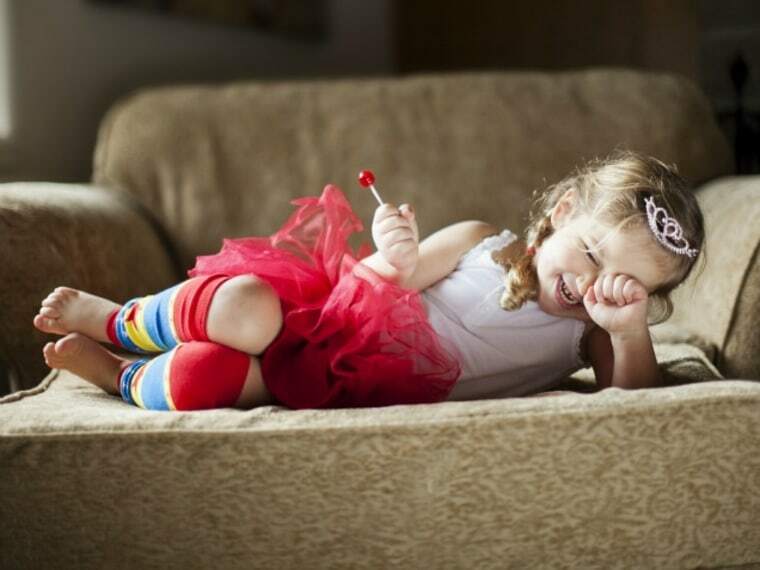 "If you can find it in yourself to let your child go out in the world with one blue sock and one red one, you're helping her develop a sense of power and confidence," says Newman. "Parents have good intentions when they say 'don't wear that, wear this,' but most of the time it's not necessary or important. You want your child to be her own person, and that's a skill she's building now." Dress her as soon as she wakes up. Lay out an outfit—one that's she's approved, naturally—the night before and get her into it when she's still groggy and half asleep. Really. "By the time she's fully awake, the clothes are on and drama is avoided," says mom Eileen. Some kids will catch on to this sooner than others, but it could buy you a few weeks or months of compliance. Plus, when she knows that getting dressed is her first job of the day—and something that must be done before she can watch TV or even eat breakfast, getting dressed early and quickly might actually (finally!) become a habit, says Dr. Robyn. Get up a few minutes earlier. One no-brainer way to avoid drama is simply to make sure you're leaving enough time in the morning, says Dr. Robyn. So set the alarm a few minutes earlier, and think about what else you can do to streamline your morning routine. Pre-pack the nonperishable parts of her lunch, hunt down library books and permission slips, have a bowl and her favorite breakfast cereal waiting on the table. The less you leave to chance, the more time you'll have to deal with a dressing dilemma if one should arise. Draft a morning checklist to help keep him on task. Brush teeth, make beds, pack backpack, get dressed: Put it down on a list and it's just another item to be crossed off. Consider a small reward (you'll read a book together or push him on the swing) for days when the list gets completed without a reminder (or incident). A timer can help him stay on track, too. Try giving him a no-brainer ultimatum. Steal this speech: "Hey kiddo. We're leaving in five minutes whether you're dressed or not. So you can choose what to put on your body now, or I can choose the outfit for you and you can put it on your body when we get to school." It works for mom Stephanie, who also has this super-stealth move up her sleeve: "Sure, you can wear shorts and a tank top today, but when we get to the park you'll need to stay in the car because it's too cold to be outside in so little clothing and it's my job to keep you safe... but it's your choice!"